A charming detached Victorian house with stunning sea views. 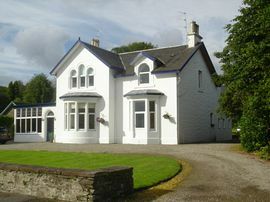 Originally built for a wealthy merchant from Glasgow and once owned by Harry Lauder, this lovely detached Victorian house with stunning views across the Holy Loch and down the firth of Clyde, offers comfort, tranquility and that much sought after "escape" from the modern day hustle and bustle. Discover stunning scenery, museums, castles and the fantastic array of wildlife that Argyll has to offer. Dunoon, our nearest town, offers restaurants, a good selection of shops, and a cinema; further afield there are plenty of good hotels and country inns, where you can meet the friendly locals. Whether you plan to stay a week or just a few days, there is an abundance of things to see and do, both for those seeking outdoor activities and those who prefer a more leisurely pace. Here at the Anchorage we aim to provide everything you would expect from a B and B and to do the simple things really well. The Anchorage provides secure parking and a small boat is available (weather permitting) for the use of our Guests. All prices are per person per night and inclusive of a full breakfast. A camp bed can be provided if required. Please note that we do not accept credit/debit cards at the present time. From Buchanan Street Bus Station direct to McInroy's Point, ferry links to Hunter's Quay pier and taxi or pick up as arranged. Take the M8 to Greenock, then follow the signs to Gourock, where you can take the Caledonian MacBrayne Ferry to Dunoon, or travel another 3 miles to McInroy's Point, to take the ferry to Hunter's Quay. Then connect with the Caledonian MacBrayne ferry to Dunoon pier. Turn right onto the promenade, travel 2 miles through the village of Kirn and Hunter's Quay. The Anchorage is then on your left at Lazaretto Point, by the Holy Loch. Turn right and The Anchorage is approximately 1 mile on the left hand side. There is a large sign in the garden. You can't miss it!